Obviously some people can’t read at the 8th grade reading level… (the level of my writing)… so I’m going to break down pre-emergents a little more in-depth for you. I have to chuckle when I see comments like… “You should not be telling people to put down more than the yearly allowed amount because that is against the law.” Hmmmm…. People that don’t take the time to READ or can’t… should also not write. So here we go. 1- What does a pre-emergent do? Pre-emergents don’t actually stop the seed from germinating. (Even though it’s the easiest way to say it and get the point across.) As the seed germinates, the seedling comes in contact with the pre-emergent chemical layer in the soil and absorbs it. The chemical stops cell division in the plant, either root or shoot, preventing it from reaching the soil surface and sunlight. As a result, it dies. So does it stop the germination… in a way yes, but it’s deeper than that. This is why we don’t like PEs on new sod. The roots are shallow and PEs can impact their growth. 2- Picking a one time, EXACT DATE to apply is a gamble. 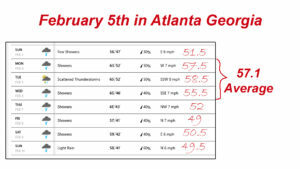 If you have a warm front move in on March 1st and the soil temps are 65 degrees for 5 days, guess what? You may have a germination of crabgrass. 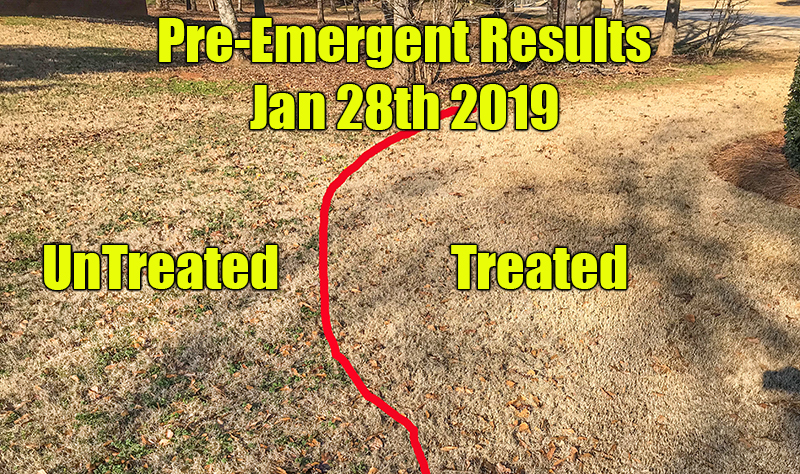 That Crabgrass and other weeds may withstand the next few weeks of colder weather and BAM… you have a battle. 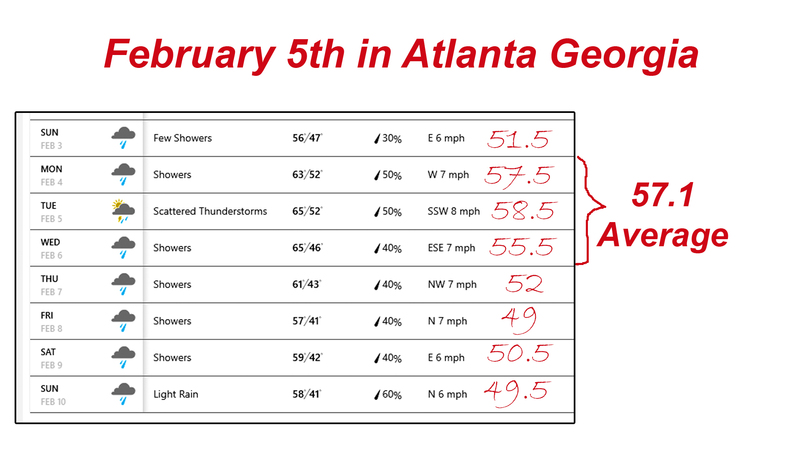 I just pulled up the 10 day and look at the temps for Feb 5th. CLICK THE PIC BELOW. This is ONE reason I split my spring PE treatments. If the “recommended date” for my area is March 1st, which it is, I will put out my first (light) round about Feb 15th. After all, most pre-emergents are effective for 2-5 months. Why not go a little early? I then follow up with the light second stage, spray, about 4 weeks later. More about that next. 3- Heavy Rains have impacts. Leaching can occur during periods of heavy rains. This is more so true with Dimension liquid rather than the Barricade Granular. It is more soluble. However being more soluble is a good thing in a few weeks. So hold on. 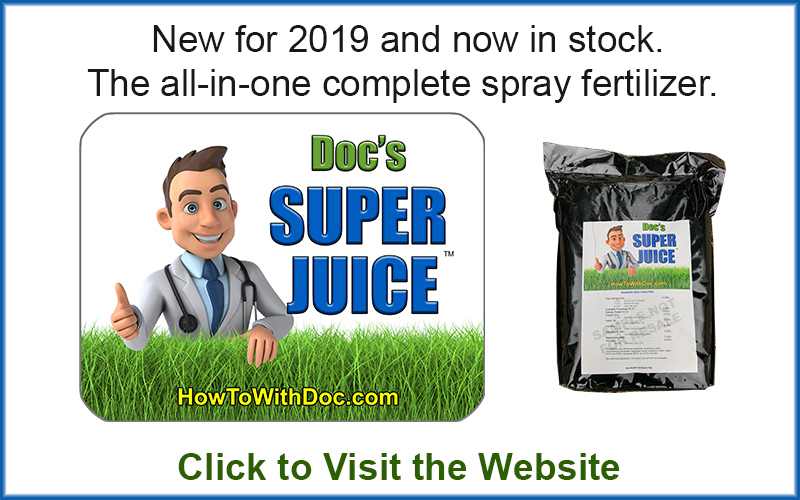 By putting out the Barricade first and the Dimension later, in light coats, this split treatment offers a peace of mind as well as proven effectiveness. 4- Use the LIGHT / LOWER end of the recommended amount. 5- What spreader setting for Granular? 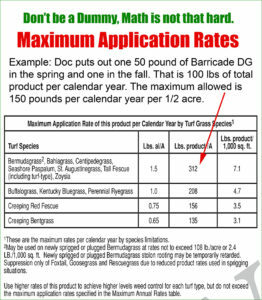 Often YOUR spreader is not listed on the bag of granular. 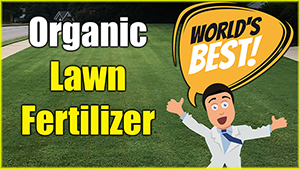 I did a video last year discussing this and Humic. Figure out the total amount amount you want to apply first. This is usually done in POUNDS. Then put out very light and in two passes if possible. To do this, ALWAYS start at the same size SLOT / OPENING as the largest particle size in the bag. Barricade DG has tiny particles so the opening will be about just over 1/8″. 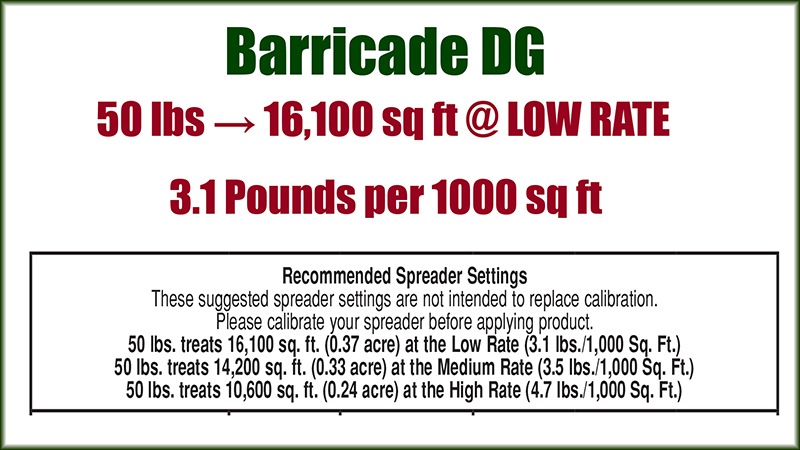 Another challenge is the fact that Barricade DG is hard to see as it comes out of the spreader. So REALLY watch your lines and walking patterns. I have found for most residential style spreaders, on a light setting, the spread pattern is about 6 feet. 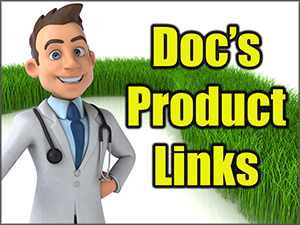 6 – Spraying the right amount / dosage. 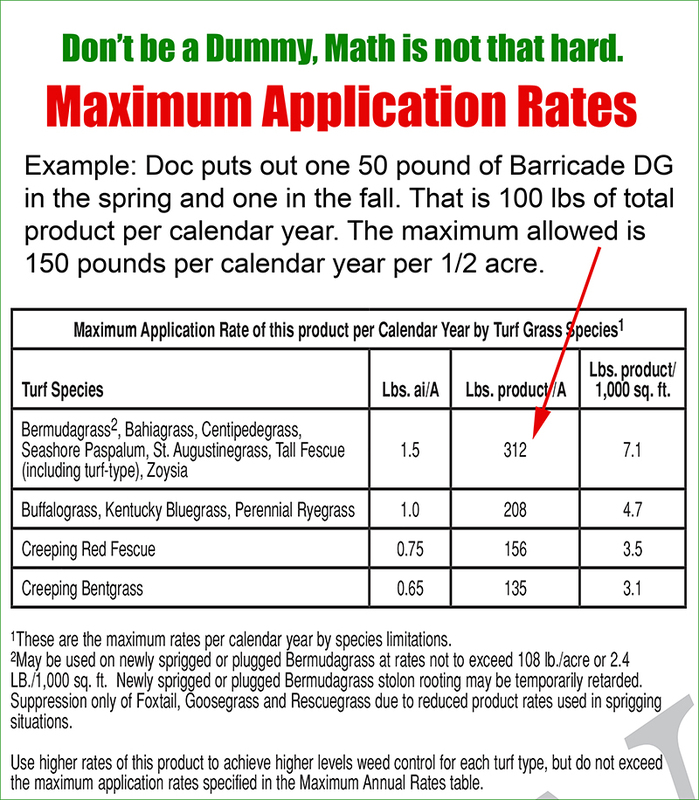 It’s easy to get accurate application rates with the bottles we show. Figure the ounces you need per 1000 sq ft and put into a bucket. 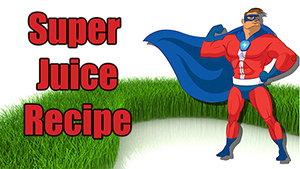 (Example: .73 per 1000 = 7.3 ounces for an entire 10,000 sq ft yard) Figure out how many bottles it takes to cover your lawn at a slow walking pace. (Usually about 2500 sq ft per bottle) so you need enough water to fill four hoses end bottles. FYI… It’s actually GOOD to slow down even more and use MORE water with PEs. It’s NOT a foilar product. It works into the soil and that is where it works. 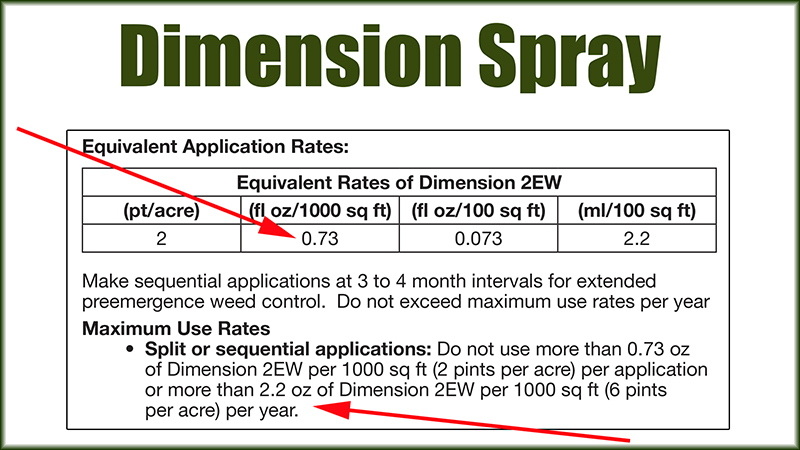 So again… you could use DOUBLE the water, SAME amount of Dimension, and simply really slow down your spray. Again, adding more WATER and slowing down is actually a good thing. It helps transport the PE into the soil. 7- Always use Dimension later. Barricade really has no POST emergent impacts on weeds. So once they germinate and start growing it is too late. However, Dimension does offer some POST emergent killing on young crabgrass. So if you did happen to have some germinate, you may be able to kill it with dimension. That is why we use the Dimension last / later. Also dimension is more soluble and will often work FASTER. If you’re late to the game… use the Dimension. 8- It’s not about overdosing, it’s about being aware and smart. This split application is NOT about putting down LOTS MORE / HUGE AMOUNTS of chemicals thinking that more is more. Even though ALL THE PRODUCTS WE DISCUSS SAY YOU CAN PUT DOWN REPEATED TREATMENTS, that’s not our point. Our point is about timing, temperature, and seasonal adjustments. Thus using PEs wisely prevents us from having to apply post emergent weed killers throughout the rest of the growing season. My Barricade treatment is actually a bit below the low rate. I use about 2.8 pounds per 1000 sq ft. Same with Dimension. I use about .60 oz per 1000 sq feet. Last year was my BEST “NO WEED” year ever. 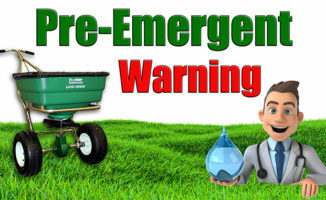 Following the above advice myself, last year was one of the first years I did not have to use ANY WEED KILLERS on my lawn, at ANY point in the entire season. Being surrounded by neighbors WITH weeds, that is pretty impressive. Yes, I had the stray nutsedge or weed near the fence from bird poopings… but it’s really nice just to simply relax and enjoy.